Suspected of killing her brother Martin, 17 year-old Robin Callowey is locked in a mental institution and forced to admit a bizarre secret: she can talk to animals. Blessed (or Cursed as she believes) with the ability to hear, see, and smell what others cannot, she copes with her overactive senses by “sleepwalking," or turning her brain "off" to everything she does for periods of time. Desperate to clear herself, Robin escapes into the Texas countryside during hunting season and journeys back home to Calloway Ranch hoping the trip will jog her memory enough to be certain she had no part in her brother's murder. By using her gift with a special herd of deer, she does, in fact, learn the details of her brother's death. But in doing so, she discovers a trail of lies that puts her in the path of a killer... someone she knew and trusted. Because my rating on this novel is so low, I am going to start out by focusing on the positive aspects of the novel first. You immediately learn of Robin's ability to understand and talk to animals. This gift, immediately catches your attention, and allows you to, for a moment, believe in the paranormal. The ending of this novel is superb A lot of things happen and are revealed that you would not expect. Even though the ending was a bit sad, it holds the promise of so much more. The formatting/editing of this book was ATROCIOUS. I had to force myself to continue reading, due to the grammar used. Words like "Nekkid", "Woulda", and "Unloosed" are used during the course of the normal narrative (to mean it wasn't the way a certain character spoke). Phrases such as "that weren't no better" and "timing was so dad-gummed perfect", take away from the overall plot of the story, and to be perfectly honest, make it understandable why the author had to be "self-published" instead of picked up by a mainstream publishing house. Although the premise is strong and catching, the book just does not back it up. Overall, I would say the book is worth reading, if only for the ending, but only if you can get through the horrible wording. 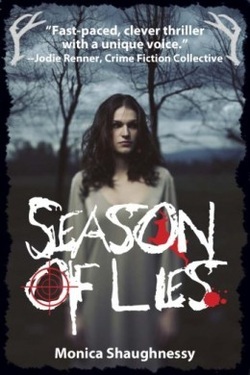 DISCLAIMER: I received an advanced copy of Season of Lies in exchange for my honest review. This has not reflected on my review in any way.